The Old Apple Store01263 715779work01603 870304fax Self-cateringThe Old Apple Store is a lovely single storey property in Honing on the edge of The Broads National Park. This property is ideal for a getaway for two wanting to visit The Broads or the beautiful Norfolk Coast. • Other: Towels, Books and Games, Travel cot and High chair, Hairdryer, Freezer space is available if required and a laundry and ironing service is offered by the owner. Duvets are feather filled and winter weight. Polyester light weight for summer or winter are available on request. • Outside: Fully enclosed patio with table and chairs and charcoal barbecue. There is also access to the owners mature garden with seating areas, lawn and covered pond. • Parking: Shared driveway with allocated space for one car. • Mobile phone signal: Can be poor depending on provider. The owners do offer use of their landline if required in an emergency. The Old Apple Store offers weekly bookings starting on Friday. The Old Apple S offers weekly bookings starting on Friday. 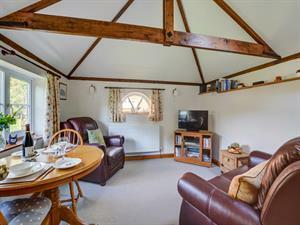 The Old Apple Store is a lovely single storey property in Honing on the edge of The Broads National Park. This property is ideal for a getaway for two wanting to visit The Broads or the beautiful Norfolk Coast.